Alziari Estate Olive Oil for sale. Buy online at Zingerman's Mail Order. Gourmet Gifts. Food Gifts. Direct from their jewelbox shop in the heart of Nice, Alziari's classic olive oil in the elegant blue tin has been one of our most popular extra virgin olive oils for years. It's made with a blend of olives from long-standing partners of the Alziari family, trucked in from the local area. But while the Alziaris use a blend of olives for most of their oil, on their own estate they also have a small grove of olive trees, from which they press a small amount of oil. For years, they made so little of their own oil that there was only enough for the family's own use. But in recent years, the Alziari family has expanded their estate bit by bit, adding a few more trees here and there, and in the process growing their supply. Now, for the first time, the Alziari estate oil is available for purchase. The olives aren't the only difference here. The way the oil is pressed is different, too. 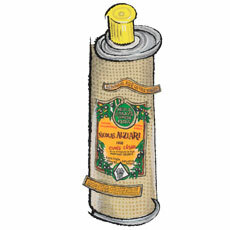 To produce this oil, Alziari presses using an ancient Provençal technique. They start by grinding the black-ripe olives in an old stone mill. Then, to separate the oil from the leftover solid bits of olive (called "pomace), they flood the basin of the stone mill with water. The oil floats to the top, and it's skimmed off little by little by hand using a tool that looks like a teaspoon the size of a shovel. It's a labor intensive process—one that I've practically never seen used by any other oil maker—but it's a very gentle way to extract the oil. Packed in a sleek tin the color of creamy Dijon mustard, the 2018 harvest olive oil smells clean and fresh, with a hint of lemony brightness. Typical of oils from Provence, the flavor is exceptionally light and delicate, with a mild green note like spinach and a creamy, buttery mouthfeel. This would be an excellent oil to drizzle over fish or potatoes. Use it in a niçoise salad or try it as a light replacement for butter.